Delivery: All over India within 7 working days. Food processor with Smart Control and complete range of high-quality accessories and blender jar for an almost infinite range of food processing tasks. 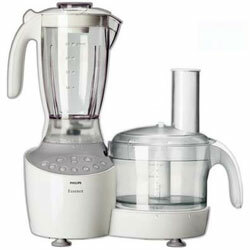 Includes citrus press and juice extractor. This Essence food processor has Smart Control, which means you can easily select the best speed and process profile for each job. The high-quality stainless-steel accessories allow you to do any job easily, ensuring perfect results. With the citrus press you can quickly make large quantities of fruit juice and the juice extractor makes fresh and healthy drinks from all kinds of vegetables, hard and soft fruits. With Smart Control you can easily select the best speed and process profile for each job. This Essence model also features a juice extractor and citrus press, for making fresh and healthy drinks and juices from all kinds of vegetables, hard and soft fruits. A complete range of high-quality accessories that allow you to do any job easily and with perfect results. A smart storage system in which all accessories can be stacked and easily stored. The powerful 800W motor is capable of handling even the toughest jobs.